Matt was up at the crack of dawn and he made sure we were too. The weather was going to be hot and steamy, but clear. We decided to give the #4 blind a try again this morning. This is the blind we were getting winded in yesterday but this morning there seemed to be a consistent East wind, which was good for that blind. Matt was dressed and out of the cabin before anyone else. He took one shot with his Diamond Edge that was dead center in the bulls eye. He calmly turned and looked at me, then said; “I’m good.” We headed out to the blind. 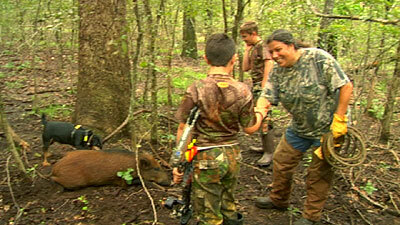 A black hog was first in and presented Matt with a good shot. During practice, we had spent a considerable amount of time on discipline – waiting for the animal to calm down and also ensuring it was at a proper angle. 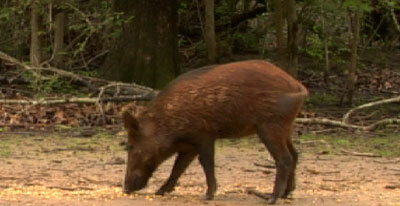 Again, Matt showed restraint and held off as the black hog trotted off. A brown hog ran in and started to feed directly in front of the blind. I moved the camera on that hog and saw Matt come to full draw. He did it, just like his big brother two years ago. He hugged Pat Jr. who was as proud as Julie and I were of him. Then Matt did a little dance as we laughed and continued to congratulate him on a well-placed shot. Nothing could wipe that smile from his face. I couldn’t stop shaking I was so excited for him. I don’t think I was this excited when I shot my lion, or my 405” caribou! We called Matt and Cheryl who came down with their little dog Sage - just in case. We watched the video in slow motion but we all knew the shot was a on the mark. For good measure, we let the dog loose on the bloodtrail and within 10 seconds his little bell stopped ringing. Matt’s hog had gone only a hundred yards. Matthew was hilarious. He was cracking jokes for the next 30 minutes. We were flying high. 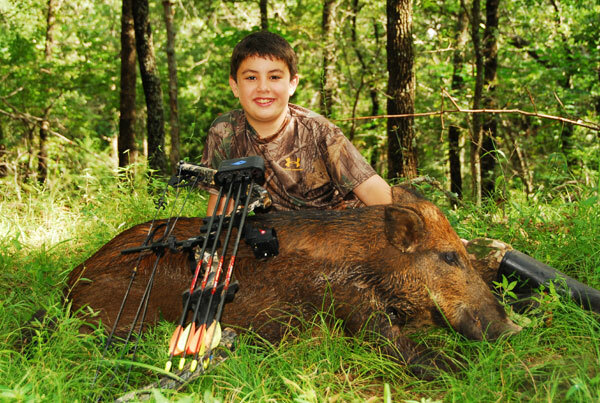 He had paid his dues in practice and preparation and delivered his first arrow perfectly into a big game animal at 9 years old! He insisted on gutting it with the knife he got as a Christmas present. He was saving its’ first use just for this moment. Afterwards we all went to lunch and celebrated Matt’s accomplishment. What a memory. Now, it’s Pat Jr.’s turn. The pressure is on. Matt joked and claimed his hog was bigger than Pat’s 2005 boar. Pat is itching to get into the blind and I can tell he’s a bit nervous. Stay tuned…. 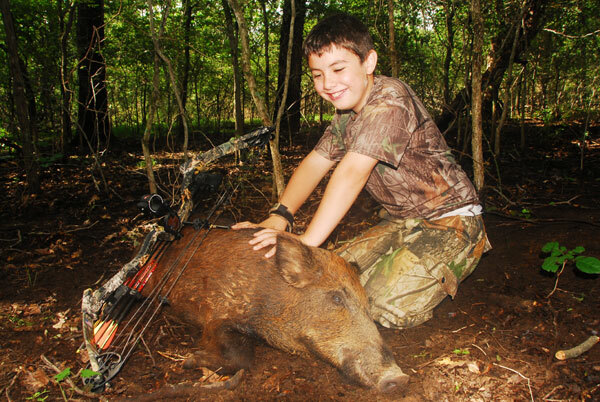 Please join me in congratulating 9 year-old Matt Lefemine on his first big game animal!